Once the pilot drill has reached the desired depth, the narrowest bone drill for that length is then used. However there are a vast variety of systems that have variations of shape, size, diameter, surface coating and so on. Generally the bone drill is used to prepare the bone to fit that particular system. The drill needs to be placed at not only the desired depth and position but at the correct angle. 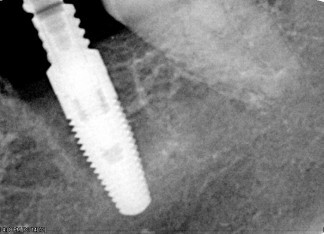 Another consideration is how deep below the gum level should the implant be placed. This allows the final crown placed on the implant to have a gum “cuff”, like real teeth do. This is also called giving the crown an “emergence profile”. This means how the tooth emerges from the implant through the gum into the mouth. This is very important in the front teeth area. The narrowest drill for the length is used first to prepare the site then the next size is used until the planned diameter is reached. That means for a WP diameter implant the bone drills need would used would be NP, RP, WP. This is to gradually prepare the site. Xrays may be taken during the procedure to ensure the implant is in the correct position. The most important part of preparing the bone for implants is not to over heat the bone. The drills are used with sterile saline irrigation, either internally or externally. The internally irrigated drills have a tube within the drill that causes the saline to exit out at the tip of the drill. The saline is delivered into the bone via the drill tip which reduces spray and improves vision of the operation. The saline is pumped via a motor when the drill is operated. The implant surgery set up will be explored in a future blog. Some systems require the prepared bone to be pre-threaded with a special bone drill called a screw tap. This is used at a slower speed than the bone drills. Other types of implants have a lot of sharp threads on their surface so it can cut its own threads in the bone. This allows the implant to be screwed in the bone initially by hand. Don’t drop it! It can’t be used again. The surface of the implant is precious as this reacts with the bone to cause it to become one with the body. The head of the implant is placed on the end of an attachment in a handpiece. The motor that drives the handpiece can be controlled. 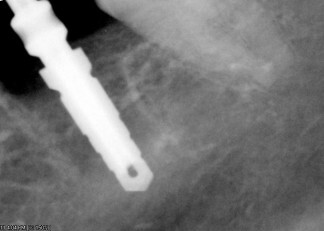 The “torque” (or force of turning) of the hand piece is determined by the type of implant and the quality of the bone. The tougher the bone the higher the torque required. Conversely softer bone requires a lower torque. Usually the upper jaw is less dense than the lower jaw. However, other considerations include age, general health and bone health, and healing of the bone at the site. The motor is called a torque controller. When the desired torque has been reached the motor cuts out. This stops over screwing the bone. The motor speed is a lot slower then the other drills used as we want to gradually change the bone shape for the implant without over heating the bone. The irrigation is turned off to allow blood to cover the implant surface. 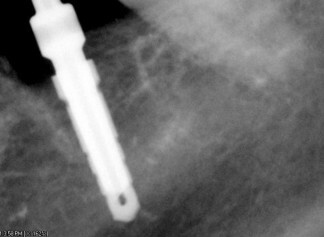 This promotes the integration of the implant into the bone. The opening to the implant has a screw placed into it to stop the gum or bone growing inside the internal threads. 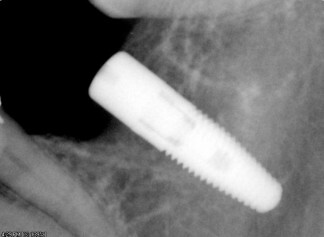 The type of screw depends on whether the implant is going to be covered over by gum or left opened. If it is to be covered then a shorter screw is need. If the gum is open then a healing abutment, which is a screw with a cylinder of various heights and shape, is used to encourage the gum to heal in preparation of the future crown. 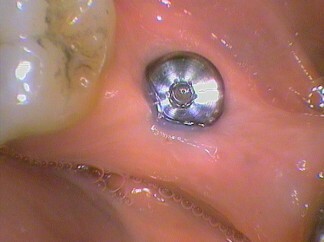 Sometimes a temporary crown is incorporated into the healing abutment design. This has been a brief overview of placing the implant as there are a lot of variables to that need to be considered that are not covered in this blog. Implants are a part of overall planning of the mouth and should not be considered in isolation.